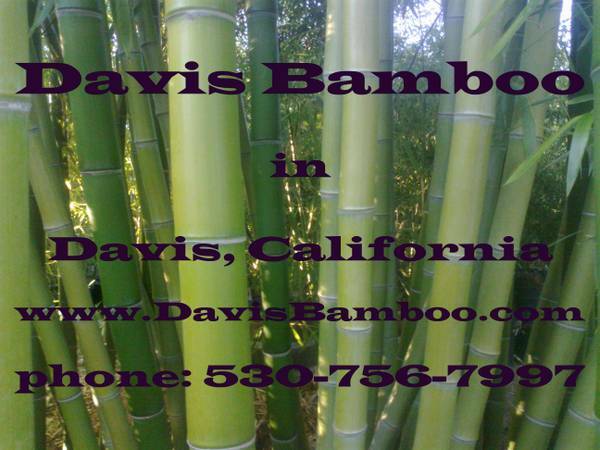 Purchasing Bamboo from Davis Bamboo: Our bamboo plants are available for sale by delivery or by appointment in Davis, California, a few blocks away from UC Davis. We keep 50+ varieties of bamboo in stock and ready for immediate purchase to residential and rural customers, landscapers, and plant nurseries. Our inventory of potted bamboo plants is the largest of any nursery within 75 miles of Davis (including all of the Sacrmento area and the S.F. Bay area). We are experts at growing bamboo and assist our customers with making the best selections for their needs and we also provide advice on bamboo care and planting. Appointments and deliveries are scheduled via telephone. We take calls between 8 AM and 10 PM. Customers are asked to come to their appointments with vehicles capable of transporting their purchases. Most of our 5 gallon nursery pots of bamboo can fit in passanger cars. 15 gallon sized plants or larger generally require larger vehicles and open bed pickup trucks with a tarp and rope are recommended. Plant prices start at about $15 and the available potted bamboo plants range in size from 1 foot tall plants in 1 or 2 gallon nursery pots up to 45 foot tall plants in 36 inch redwood planting boxes. Most customers purchase either 5 or 15 gallon pots of bamboo. Bamboo Delivery: Delivery of bamboo plants up to 15 feet tall is available at a rate of $1.50 per mile (calculated one way from Davis to the delivery location) plus the cost of any tolls. Plants taller than 15 feet may require an additional delivery surcharge. The minimum delivery fee is $40. The minimum bamboo purchase for which we will provide delivery is $250. About Davis Bamboo: Our chief is Daniel J. Nurco, Ph.D.. He is a long-time member of the American Bamboo Society and a University Lecturer. He has been growing bamboo in Davis for over 20 years. One goal we have is to provide the best bamboos that exist for our climate so that they will grow well and look great 12 months out of the year.